BOLTON Bhd announced today that it has, through wholly-owned subsidiary Majestic Focus Sdn Bhd, completed the acquisition of the remaining 500,000 ordinary shares of RM1 each in Prima Nova Harta Development Sdn Bhd for a total of RM28.04 million. The acquisition will enable Bolton, via Majestic Focus, to have full control of Prima Nova and to consolidate 100 per cent of the future results of Prima Nova, the group said in a filing to Bursa Malaysia. This was in line with the group's focus on its core business of property development and to enhance the group's future development earnings, it said. Prima Nova has created a strong brand under "Taman Tasik Prima" for its middle to high-end residential properties in Puchong with a 345-acre mixed develpment, it added. Bolton said Taman Tasik Prima's future development will include mixed residential and commercial development of about 3,000 units of terrace houses, low- and medium-cost flats, service apartments, showroom shops and a retail mall with a net lettable area of 250,000 square feet. It will be developed over the next seven years with expected gross development value and gross development cost of RM650 million and RM500 million respectively. PETALING JAYA: Sunway City Bhd (SunCity) expects earnings contribution from its offshore property development to increase to 30% by 2015 from less than 5% now. To achieve this target, the company recently established a new international property development division headed by managing director Ngian Siew Siong while former chief operating officer Ho Hon Sang has been appointed managing director of the local property development division. Ngian said SunCity was focusing on developing its presence in China, India and emerging markets such as Vietnam. Ngian said China was one of the biggest foreign markets for SunCity and it was looking at opportunities in tier one and tier two cities. “China, with its fast growing middle class and high urbanisation, will make up more than 50% of our total foreign earnings in the coming years,” he said. SunCity has two projects in China. Its maiden project – the 17-acre Sunway Guanghao project in Jiangyin – is expected to be launched by June. Comprising medium-end condominiums and specialty shops, the project has an estimated gross development value (GDV) of RM492mil. The Sunway Guanghao project is a 39:26:35 joint venture between SunCity, SunwayMas Sdn Bhd and Shanghai Guanghao Real Estate Development Group Co Ltd.
Its second project is in Tianjin. SunCity will be signing a 60:40 joint venture agreement with Sino-Singapore Tianjin Eco-City Investment and Development Co Ltd (SSTEC) to undertake the development of 110 acres within the Tianjin Eco-City project. The eco-themed integrated project by SunCity will have an estimated GDV of RM5bil. It is expected to begin next year for completion in five years. SSTEC, a 50:50 joint venture between a Chinese consortium led by Tianjin TEDA Investment Holding Co Ltd and a Singapore consortium led by Keppel Group, is involved in the development of the 7,500-acre Tianjin Eco-City. In India, the company’s inaugural project is Sunway Opus Grand Residency located in Ameenpur, Hyderabad. Comprising more than 3,000 units of condominiums on 30 acres, it will be launched by year-end. Prices are expected to start from RM200 per sq ft. The 50:50 joint venture with Opus Developers and Builders Pte Ltd has an expected GDV of RM1.2bil. Ngian said SunCity had another development on a 14-acre site near Hyderabad. The RM380mil project comprises 1,500 condominiums priced from RM208 per sq ft.
Apart from these projects in China and India, the company is on the look-out for suitable land in Ho Chi Minh City. It also plans to undertake a joint-venture with Australand to develop 123 acres of industrial property near Sydney, worth about RM800mil. Ho said SunCity had 10 ongoing projects in Malaysia and aimed to hit the RM1bil sales mark in the financial year ending Dec 31. It reported RM410mil sales last year. The company will be launching RM1.47bil worth of projects this year including the RM250mil Sunway Rymba Hills, comprising 80 bungalows, in the Sunway Damansara township in Selangor. Also in the pipeline is Sunway Velocity, an integrated development which consists of serviced apartments, shopping mall and retail space in Kuala Lumpur. Earlier this month, SunCity proposed to dispose its entire interest in selected properties to a real estate investment trust to be set up by the company and listed on Bursa Malaysia. The proposed properties include Sunway Pyramid Shopping Mall, Sunway Resort Hotel & Spa, Pyramid Tower Hotel, Menara Sunway, Sunway Carnival Mall, Sunway Hotel Seberang Jaya, Suncity Ipoh Hypermarket and Sunway Tower. It said proceeds from the asset disposal would be used to acquire land bank, working capital, future business expansion and to repay SunCity’s borrowings. For the 18-month period ended Dec 31, 2009, SunCity recorded a revenue of RM1.6bil and pre-tax profit of RM1.2bil. Excluding a revaluation gain of RM804.9mil, adjustment for depreciation of RM10.6mil and upfront fees of RM10.5mil for banking facilities, the company’s pre-tax profit stood at RM428.4mil. The revaluation gain was attributed to Sunway Pyramid Shopping Mall’s fair value gain of RM680.4mil, Sunway Carnival Mall’s RM58.5mil gain and 20 other investment properties’ gain of RM66mil. YTL Corp Bhd plans to open six new spas under the “Spa Village” brandname over the next three years, building up its leisure and hospitality portfolio. The Spa Village is the world’s only spa to base its therapies on the healing heritage of the Baba-Nyonya — a unique combination of Chinese and Malay influences. YTL operates six Spa Villages currently — in Pangkor Laut, Kuala Lumpur, Cameron Highlands, Tanjong Jara, Malacca and Tembok, Bali. All the spas have their own signature treatments. YTL vice-president of spa division Chik Lai Ping, said business has been sustaining well despite the global financial turmoil. “The spa continues to act as an amenity to the guests in the resort. We have a lot of followers that travel to all our YTL hotels and resorts to explore the uniqueness we have created for each space. Some travellers stay in the resort because of its Spa Village,” Chik told Business Times via email. Chik said time and research are invested far in advance before a spa is developed. She did not elaborate on the investment costs involved. The first Spa Village was officially launched by the late Luciano Pavarotti in September 2002 at Pangkor Laut Resort in Perak. “Ever since we opened it, we have won many awards and recognition including Pangkor Laut Resort being named ‘Number One in the World’ by Condé Nast Traveller in 2003,” Chik said. British newspaper, The Sunday Telegraph placed the spa among the World’s Top 25 Spas. In 2003, it also won first place in British Conde Nast Traveller’s Awards for Best Overseas Destination Spa, beating venerable places like Les Sources des Caudalie in Bordeaux, France and Clinique La Prairie in Switzerland. PRIVATELY-HELD Teo A. Khing Designs Sdn Bhd (TAK) is looking for Malaysian companies to participate in the development of China’s US$4 billion (RM12.8 billion) Tianjin Horse City project. TAK was recently awarded the project to design, construct and manage China’s first race course, together with its partners Meydan City Corp and Tianjin Farm Group. “We are participating by taking some stake in the project. At the moment, we do not yet know how much. Maybe we will participate by sharing our know-how (of the horse racing industry) without investing money into it. Then, from there, it will turn into equity…we don’t know yet,” TAK managing director Teo Ah Khing told reporters in Dubai last week, in conjunction with the Malaysia Services Exhibition (MSE) 2010 there. MSE 2010 ran between April 13 and 15 and showcased some 150 Malaysian companies from eight service industries. Fresh from its success in delivering the iconic Meydan Race Course Grandstand in Dubai, the company is currently scouting for other Malaysian companies to take part in the Tianjin Horse City development. The Meydan Race Course consists of a dramatic grandstand for 80,000 spectators, a Royal Enclosure, the world’s first luxury trackside hotel, a Bubble Restaurant, the Falcon Carpark, a Turf and Dirt track. “At the peak of the Meydan project we had about 3,000 Malaysians working with us. 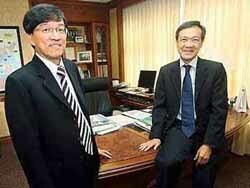 There are many Malaysian companies behind us,” Teo said. He said he managed to speak to “a few companies” during the MSE 2010, and is looking forward to further discussions with them. He declined to reveal the companies he had had discussions with. “They (the project promoters) have no need for money, but what they do need is expertise. The whole idea is to bring the whole knowhow of the horse racing and locate it there in Tianjin,” Teo said. Work on the development is expected to start by the end of the year. According to media reports, Tianjin Horse City will be established in Ninghe County, Tianjin and include five-star to seven-star luxury hotels, a clubhouse, commercial offices and residential facilities. The project is expected to develop a horse industry economy that will establish a production franchise across China.